iTunes release on April 1 and Physical Release April 22, 2014. 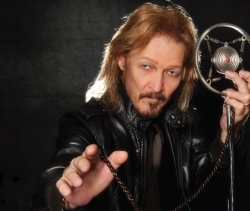 Los Angeles, CA, March 24, 2014 --(PR.com)-- Best known for his quintessential portrayal of Jesus of Nazareth in Tim Rice and Andrew Lloyd Webber’s beloved, “Jesus Christ Superstar,” Ted Neeley is releasing the appropriately titled “Rock Opera.” Ted plays to his strengths on the new 5 song EP and showcases his vocal range, which made him an icon of stage and screen since the film by Academy Award winning director, Norman Jewison, was released. “Rock Opera” highlights selected tracks from the original Rock Operas, Superstar and Tommy as well as unique collaborations with longtime dear friends. Present day computer technology allowed “Rock Opera” to feature a duet with the late Carl Anderson and as Ted explained, “It was one more chance to sing with my musical collaborator and best friend.” With this collection of songs, Ted hopes to please everyone who loves the combination of Rock and Musical Theatre. The iTunes digital version will be released on April 1, 2014 worldwide and it includes an exclusive track, the beloved and emotional Live Version of “Gethsemane” from Jesus Christ Superstar. The physical CD package which includes a poster and a never before seen picture of Ted on set in Israel, while filming Jesus Christ Superstar in 1972, will be released on April 22, 2014. “Rock Opera” was produced by Frank Munoz (Ace Frehley’s Anomaly, Jason Newsted’s METAL EP) and was born out of a partnership with fan-funded site, Pledge Music and Ted’s newly founded TedHead Records. The imprint was aptly named as a nod to Ted’s dedicated fans who supported a two-month promotion that successfully raised the capital required for the “Rock Opera” project to be recorded and marketed. Ted is currently in Italy performing as Jesus of Nazareth in Jesus Christ Superstar 2014, Live at Il Teatro Sistina in Rome, produced and directed by Massimo Romeo Piparo. Ted is available for interviews pertaining to his current performances, along with the Special Anniversary In Person Screening Tour of Jesus Christ Superstar and the new “Rock Opera” release.